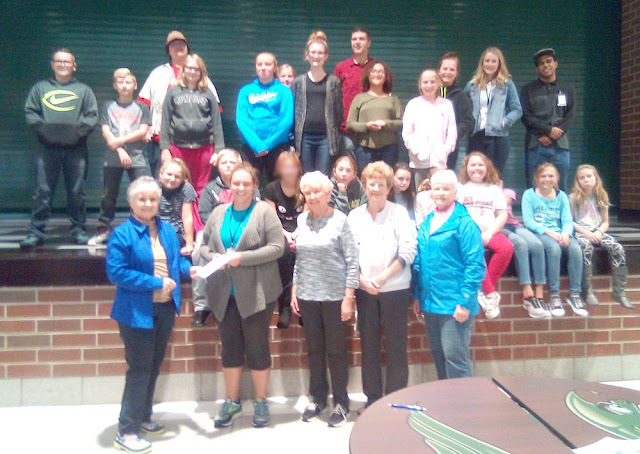 GREENVILLE - The local Gamma Epsilon Chapter of Lambda Chi Omega National Sorority recently added Empowering Darke County Youth to its list of charities and activities. Four members of the local chapter – Charlotte Wright, Linda Rehmert, Jane Williamson and Barbara Anthony – met with volunteers, tutors and Greenville students to show their support for the Empowering programs. Lambda Chi Omega is a national philanthropic sorority organized in 1923. Its purpose is to promote fraternity, social development, charity and education. The Gamma Epsilon Chapter was organized in 1965 and has nine active members, plus two alumna members, many of whom have been members for over 50 years. Their annual money-making project is selling ads for the Darke County Fair Race Programs. Empowering Darke County Youth began its third year of After School tutoring in September. So far, the program has more than 130 requests for help. Tutors and volunteers work with an average 50 students a day. According to Jones, expenses, especially in snacks and supplies, are high. “This donation will go a long way toward helping us meet those needs,” she added. Other Gamma Epsilon Chapter charities and activities include Aid to local residents in need, LCO Gamma Epsilon Scholarship for GHS seniors entering a healthcare field, Community Blood Drawing sponsorship, assembling and serving lunches to Special Olympics participants, bingo with residents at Brethren Retirement Community, Shelter from Violence, Reading is Fundamental, Mitten Tree, Greenville Public Library, Garst Museum, Heartland of Greenville, Support of troops overseas, and National LCO charities. Donations may be sent to PO Box 1113, Greenville, Ohio 45331. More information? We need volunteers! Contact Empowering on Facebook or email empoweringyouth101@gmail.com.